Mold in your home or business is bad news. Health risks such as allergy-like respiratory symptoms, irritation of your skin, symptoms similar to cold and flu, headaches, nausea and asthma induced by mold. These are symptoms that can definitely impact your health! It is very important to know what causes mold growth so you don’t cause damage to your health and your home structures. Let’s think about what causes mold damage. Moist, wet areas like your bathroom. The bathroom(s) in your home are natural breeding ground for mold growth. When you take a shower or bath, moisture lingers and sticks to your bathroom windows, shower liner, walls, linoleum, grout, tiles, decorations or any other area of the bathroom. If you do not have your bathroom properly ventilated, this moisture will cause mold to grow in your bathroom. Leaky plumbing. Moisture is what breeds mold. If you have toilets, sinks, or pipes dripping in your house- this is a perfect spot for mold to grow. If you don’t notice the leaky plumbing, you will start having standing water. This standing water can create a serious mold problem very quickly. The first thing you want to do is inspect closely to determine the extent of the mold damage. Look under sinks, check out exhaust fans, check out your pipes, even look under your bathroom shower door. Once you find the mold and can identify it, call a mold professional as soon as possible. Why call a mold damage specialist? Check out these mold profiles. Cladosporium is one of the most common molds you’ll find indoors. If moisture is found on wallpaper or carpet, Cladosporium is usually to blame. Cladosporium really grows anywhere mold is present. It likes to grow on carpet, walls or leaky pipes. When you find mold in these areas, Cladosporium is not the only kind of mold you will find. You will also find Aspergillus or Pencillium. The way to tell it apart from other molds is it takes on a olive green, brown or black look. This is the reason to not assume all black mold is actually Stachybotrys chartarum, the very harmful “black mold”. How can you tell the difference between the two? You have to call a mold specialist so you are not dealing with exposure to a very hamrful and destructive mold! So why do we care about Cladosporium? When there is alot of it, people with allergies or respiratory diseases will start to become affected. You’ll start noticing itchy eyes, sneezing, runny nose, coughing and other allergy-like symptoms. If your exposure lasts long enough, the presence of constant mucus in your respiratory system will lead to sinus infections and other respiratory infections. Aspergillus is another form of commonly found household mold. For people with normal immune systems, Aspergillus is pretty harmless. However, if you have a compromised immune system, Aspergillus can cause alot of problems for you. 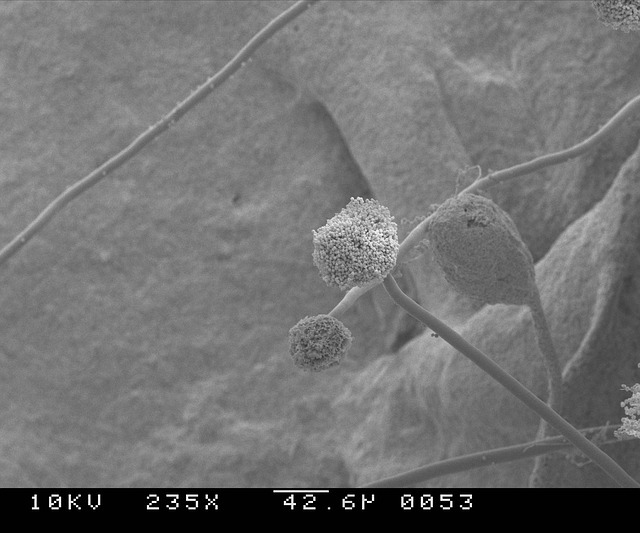 So why do we care about Aspergillus? Since it is so common, Aspergillus is categorized into several hundred mold species.. this is why proper identification is key! Aspergillus is most often found in the Northern hemisphere and usually likes to grow on carbon-heavy items, such as bread, trees, potatoes or plants. In you home, this translates to damp walls, fans, wallpaper, filters, floorboards, HVAC insulation, carpets and more. For the general population, Aspergillus is harmless. However, if you suffer from respiratory issues, you can develop aspergillosis. Aspergillosis claims thousands of lives every year. While black mold isn’t one of most common types of mold to grow inside, it isn’t rare for it to. Black mold has a greenish-black color that grows only when moisture has been present for a long time. Water damage, condensation, excessive humidity and water leaks are all perfect growing conditions for black mold. This is usually why you see black mold be associated with storm or hurricane damage. So why do we care about Black Mold? Black mold releases microtoxins. What are microtoxins? Microtoxins are a noxious substance that causes harm to people. 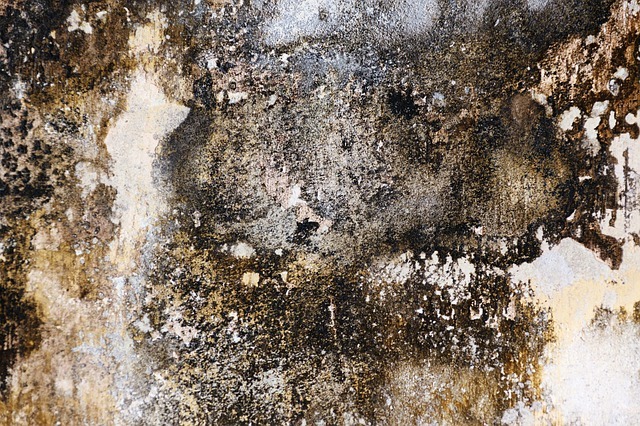 What are the symptoms of black mold? Can I clean up mold myself? We recommend not attempting to clean up any kind of mold by yourself. A comprehensive mold remediation plan is the best course of action to make sure the mold is removed completely from your home. The problem with trying to clean up mold by yourself is it is difficult to determine what kind of mold it is without prior experience or testing. All molds have the potential to be hazardous to your health and can have consequences on the structural integrity of your home. Once you see mold, you should take steps to have professionals come in and eradicate it immediately. In order to prevent mold growth in your home or business, here are some things you can do to keep mold from growing. Don’t let pipes, faucets or shower heads leak. As soon as you see a leaky pipe, get it fixed. Make sure your home and bathroom is well-ventilated. Don’t close up windows and doors for long periods of time (like when you leave for vacation). Whenever you take a shower or bath, turn on the ventilation fan or open a window. 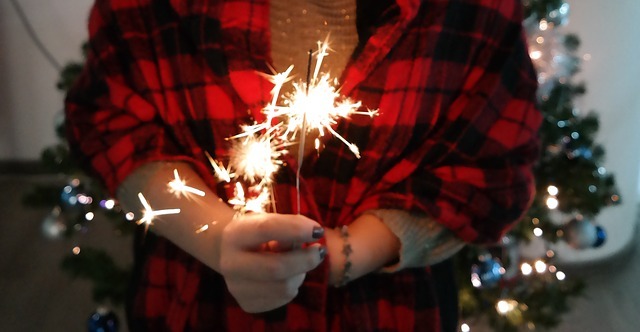 Try to let the air circulate for 30 minutes. Wipe moisure your tile or grout after use and don’t let moisture sit on your tile or grout. When decorating, use mildew-resistant shower curtains or window curtains. Keep the area rugs in your home washed frequently and make sure they are completely dry before you put them back on the floor. Don’t leave wet towels or wet clothes lying around. Here at ServiceMaster by Glenn’s, we have almost 40 years experience dealing with mold damage and mold damage restoration. Call the experts and don’t risk your health or your home’s health over mold. Call our 24 /7 / 365 hotline at 772-567-4435. 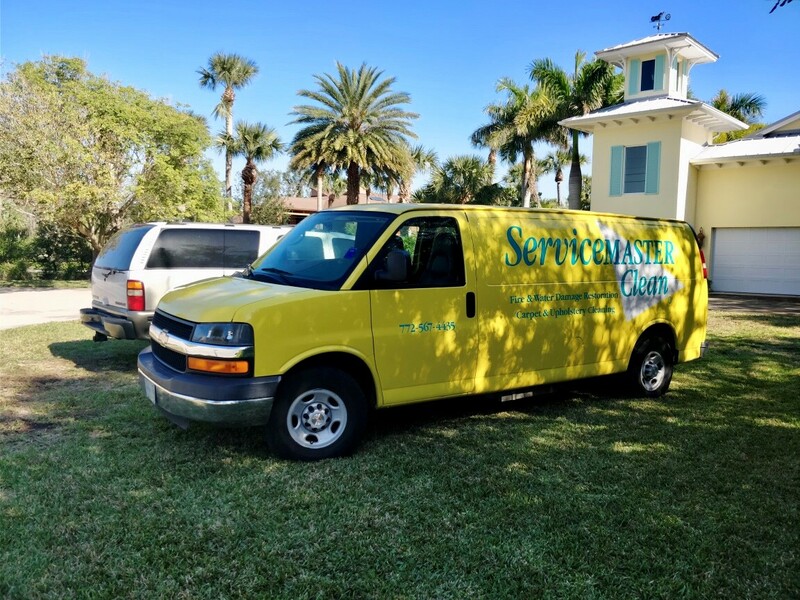 ServiceMaster was initially at a job for a water damage on River Drive in Micco, FL involving a pipe break that flooded a 4 car garage. The water damaged caused mold on boxes and boxes of medical records and documents. Since we know how to re-mediate such items, we started working on drying those out. 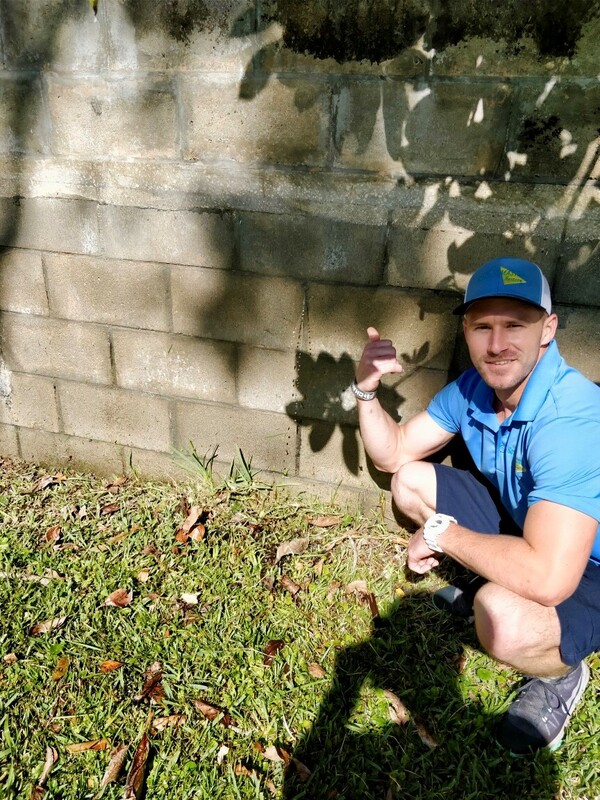 While we were there, our certified technicians noticed the yard was starting to flood and then noticed a small hole (the size of a pin!) in the neighbors walll where water was spraying through. It was a septic (pump) overflow issue! We called in a septic company and a plumber to fix the issue right away. Because of the thoroughness of our certified technicians, another potential emergency was avoided. Remember, when you are in need of someone to save the day… call ServiceMaster By Glenn’s!